Spindrift 2 has had her first sail after her winter optimisation, spending a successful night in the Bay of Biscay. With 15-25 knots of wind and a full moon in a cloudless sky, the weather was perfect for the 40m long maxi-trimaran during her first offshore trial run of the season out of La Trinité-sur-Mer. "The season has started and it's great,” said co-skipper Yann Guichard. “What a pleasure to be sailing again and rediscovering this boat. Things felt really good out there and our technical assessment has been very positive too. After the changes we made, Spindrift 2 is behaving as expected. With the crew, we feel that the boat is still safe and sound, but lighter and more responsive. We also really improved the speed of our manoeuvres. Overall, although we still have work to do calibrating all the sailing instruments, to match the numbers, the team can be proud of what it’s done." Dona Bertarelli was equally happy on the trimaran on which she and her team will attempt to beat the west to east record across the North Atlantic between New York and the Lizard this summer. "After a long winter and the considerable amount of work in the boatyard, it was a real pleasure to be back on board with the whole team for our first sail,” an enthusiastic Bertarelli said. 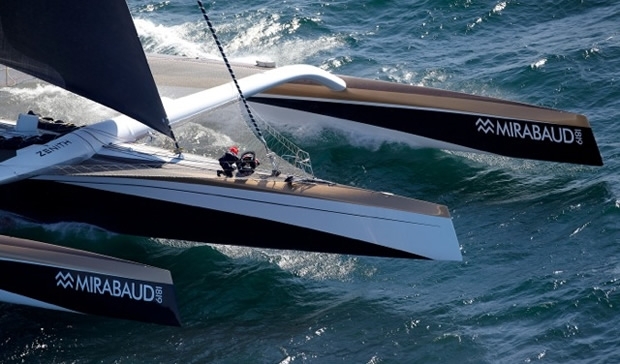 “Spindrift 2 has lost nothing of its aura or its dynamism, quite the contrary. Shining with the colours of our new partners, she looked better than ever on the water. You should’ve seen the smiles on everyone’s faces when we did the first unfurl (of the headsail)…we were quickly up to 35 knots." This week, the Spindrift team will be racing on Lake Geneva as they begin their D35 training. Ladycat powered by Spindrift will be in Versoix, Switzerland for a first week of training before the start of the annual Vulcain Trophy championship for the D35s starting on 9 May with the Grand Prix des Ambassadeurs out of the Société Nautique de Genève. So between Lake Geneva and the Atlantic coast of France, the Spindrift crew is engaged on all fronts. The competitive deadlines are approaching and the race against the clock continues. After a few days of work for the technicians at the team base in La Trinité-sur-Mer, on April 28 the sailors will be back on board the maxi trimaran Spindrift 2. On the horizon is the delivery to New York and then Newport, where the boat will begin, from the start of June, its official stand-by period, waiting for a good weather window in order to attempt to break the supersonic North Atlantic and 24-hour records.